"Turn your face to the sun and the shadows fall behind you..."
Maybe because Cameron wore eye glasses at a young age, he had an aversion to sunglasses before this year. 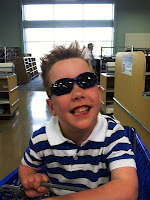 However, we were quite excited to see that this sunny season, Cam was ready for a pair of shades. He actually picked out two pairs that suited his taste. Now that he's gotten so many compliments, he wants them on every time he gets in the car or is outside in the sunshine. Cam had his first official "working" ride on the new lawnmower. He rode with Chris for over 40 minutes mowing the front and back yard. Cam's Dad gave him the headphones to wear because it's actually quite loud! The unseasonably warmer weather continued throughout the week. 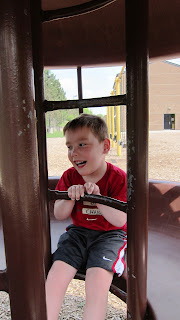 Cousin Libby went with Jane and Cam to check out the Meadow Brook Elementary playground. 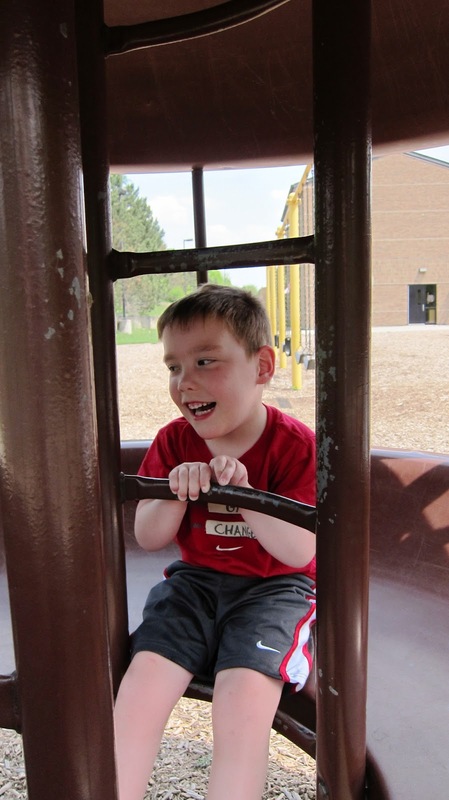 Since this will be Cameron's school in the fall, we thought it would be fun to see what his favorite outdoor activities would be there. Libby and Jane were a bit surprised to find that Cam's preferred choice were the "saucers" that you sit inside of. Of course, he had to check out both of them in case one was different from the other. It did feel a little cooler inside the spaceship like structure versus the very sunny swings or slides. Another riding adventure for Cameron was trying out his bike this year. Last summer, he was still a bit too short to use the pedals effectively. But, this year....those legs are getting some great exercise!! When you come for a visit, you may see some road signs in our driveway and a very happy biker! Look at him GO, indeed!!! That's awesome! Can't wait for you to share more videos/pictures of him on the bike! Hope you are well!